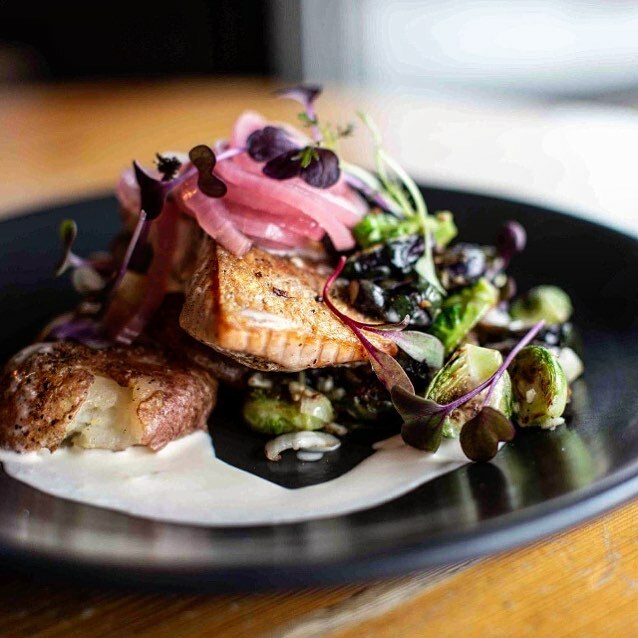 Find the perfect Grand Rapids restaurant with this Top 10 list as compiled by our Grand Rapids team. Grand Rapids is more than breweries though there are some of the world’s best here. It also has a thriving food scene, and there is no better way to experience that than going out with friends or that special someone on Valentine’s Day. We live here, and we work with properties all over West Michigan which means that we EAT all over the area. We decided to poll our Grand Rapids team to dig out their recommendations. We have some pretty serious foodies, and ended up with 20+ recommendations. We went through all the votes, did a recount, and compiled the restaurants into our Bradley Company Top 10 Valentine’s Day Date Spots. If an amazing steakhouse is your idea of the perfect date night, you should consider The Chop House. Substance and flavor come together for a top shelf steak dinner with delicious sides. If you have a certain affection for Italian Cuisine, you won’t regret going to Amore for Valentines Day. Chef Jenna effortlessly blends the local food culture of Grand Rapids with the heritage of authentic Italian cooking picked up after living in Italy for a number of years. Be warned, you might just ruin any future dates at Italian restaurants by setting the bar so high. It’ll be worth it though. Go for the Chef’s Choice Risotto, or the Pescatora if you like Seafood + Pasta. Delicious cuisine, and great craft drinks all in a relaxed, homey feeling atmosphere. If you’re looking for something more chill for date night, but still want some great food and drinks Noco Provisions has you covered. Specializing in Modern French & Italian Cuisine made from scratch, Bella Vita has ingredients as fresh as their take on Mafaldine. What is more romantic than fresh house made pasta with a glass of wine? Nothing, according to several voters from our team. A delicious, intimate dining affair, The Grove comes as a special dinner treat indeed. Focused on locally sourced and seasonal dishes, the menu never gets old, and is constantly providing something unique to the area. We’re fans of any place that can put “Crab Churro” and “Carrot Cavatelli” on the same menu and both dishes be amazing. Better get reservations if you intend to make this your Valentines Day spot this year. Ruth’s Chris is consistently one of the top ranked chain steakhouses, and the Grand Rapids location is no different. We love the consistently great steaks and sides, their valentines day menu is especially catered towards a great date night. Make sure to make reservations though! San Chez Bistro offers a blend of authentic European, Mediterranean, and Latin American cuisine in a fun, laid-back, and artful atmosphere. This is a great spot for sharing small plates on a date! Experience new delicious flavors together and have a dinner you’ll be talking about for weeks to come! This award winning distillery pairs carefully crafted dinner and brunch options with amazing adult beverage options. They partner with local farmers for an authentic farm-to-table experience. This is one of the favorites of those who like to have a great dinner AND a great drink. We love being a part of this community! If you want to add more restaurants to the list, check out our Facebook Page and leave a comment, we’d love to add to the list.